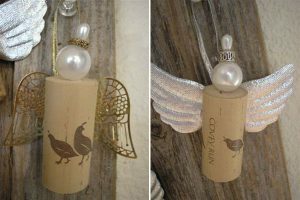 If you’re looking for a quick and easy way to recycle your wine corks, look no further. These projects only require 1 (one) wine cork each. Of course, you’ll probably need a few more materials (as documented in the tutorials). 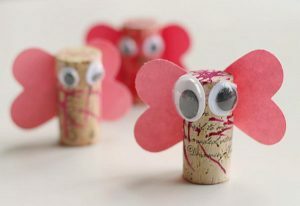 These cute love bugs are a perfect craft for your kids for Valentine’s Day, Mother’s Day, or any day. Check out the tutorial at NoTimeForFlashCards. Perfect gifts for friends. Check out CraftersLoveCrafts for the tutorial. Air Plants don’t have roots and don’t require soil. 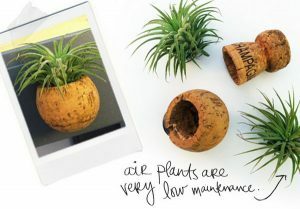 Just spray your air plant with water once a week and expose to indirect sunlight. This project actually requires a champagne cork instead of a wine cork, but you’ll thank RueLaLa later. This is actually a keychain craft, but could also double as an ornament since it has a beaded charm.